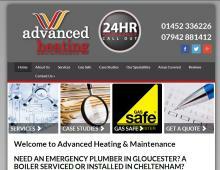 Advanced Heating & Maintenance are professional plumbers in Gloucester, they offer a wide range of plumbing and heating services in Gloucester and Stroud. The qualified engineers from Advanced Heating & Maintenance cover Stroud, Cheltenham, Tetbury, Ledbury & Gloucester. Whether you are looking for a boiler service in Cheltenham or an emergency plumber in Gloucester, Advanced Heating & Maintenance provide a rapid response service. Their team of plumbers have an outstanding reputation locally in Gloucestershire. If you are looking for a gas safe engineer in Stroud or Gloucester, Advanced Heating & Maintenance have qualified engineers to solve your plumbing and heating problems! Contact them today for a free quotation.